Need a pair of robust, sweatproof, wireless headphones to improve your performance? Discover the best workout headphones. What Sports Headphones to Avoid? What are the Best Over-Ear Headphones for Working Out? What Makes the Best Wireless Workout Headphones? Are Wireless Workout Headphones Better than Wired? Can I Shower with My Workout Headphones? What Sports Headphones to Avoid | Are Wireless Better Than Wired? | Can I Shower with My Workout Headphones? After extensive research (more than 70 hours of work, checked over 50 headphones) of the best workout headphones, you can take advantage of our guide to make an educated buying decision. Instantly know what workout headphones are worth your money and which to avoid. It’s common sense if you’re serious about fitness you need a great pair of sweatproof headphones. Thankfully, you don’t have to waste your time researching; we’ve done it for you. Below you can learn about the best-rated and most popular headphones for working out right now. Small in-ear headphones are the most popular choice when it comes to sports. Because of lighter design and better noise isolation, many people choose them as the first choice. If you have an iPhone X or another phone without the 3.5mm support, you don’t have any other option. You need Bluetooth headphones, and wireless earbuds are the best in this class. Bose SoundSport Wireless quick review. The new Bose SoundSport Wireless are, in our opinion, the best sports headphones overall—and also the best wireless workout earbuds right now. 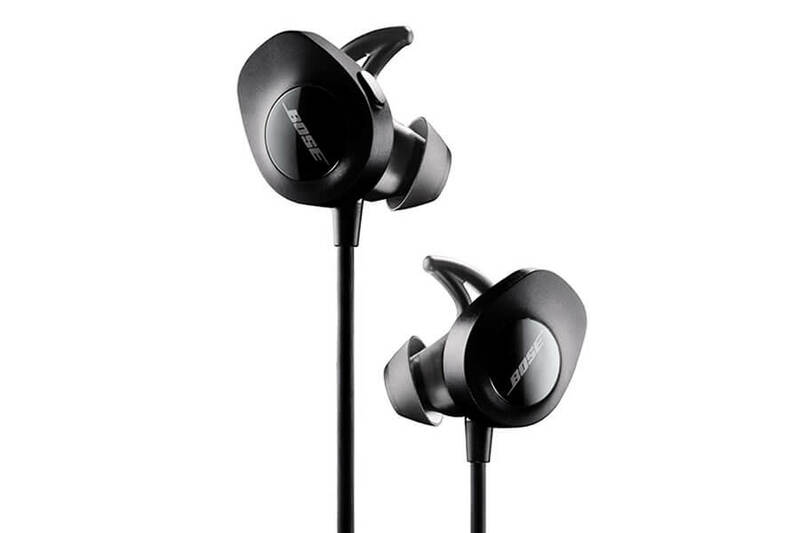 Keep in mind Bose SoundSport Wireless have a slightly bass heavy sound quality, typical for Bose. In case you like more balance, check the Jaybird X3. Bose SoundSport Pulse are the same wireless earbuds but cost slightly more due to having a heart-rate monitor. Note: If you have an iPhone X since it doesn’t have a 3.5mm input you need Bluetooth headphones. The Bose SoundSport Wireless work with the iPhone and are also the best wireless workout headphones for the iPhone X right now. Very stable fit even during exercise, mediocre noise isolation, bigger casing. With the help of winged ear tips, the fit is as stable as you can get from any wireless earbuds. These aren’t exactly regular in-ear monitors because the earbuds don’t protrude that deep into ears. The earphone is shallower and rests on the outskirts of your ears. This gives you a reliable fit but doesn’t provide good passive noise isolation. In case you’re wondering, SoundSport Wireless aren’t noise-cancelling earbuds either. They leak more sound than other earbuds, but this isn’t necessarily a bad thing. If you want to use these outside, it’s good to hear what is going on around you to avoid possible traffic accidents. At the same time, if you use these in a quiet place with high volume, others will hear your music, so they aren’t meant for the office. Nonetheless, for sports use, in the gym, court, track and outside in general, they are great because they stay put and keep you aware of your surroundings. The only bad thing about the fit is that they are rather large and protrude out of the ears. The big size makes it impossible to use for sleeping, and you will look a bit dorky. The most comfortable workout earbuds, period! Stable and comfy in all situations. Apart from all other qualities, comfort helps a lot with making these Bose earbuds the best wireless buds for sports in our opinion. Just like with other Bose headphones, comfort is superb. If you have problems comfortably fitting other gym earbuds, try Bose SoundSport, wireless or wired models both do a great job. These are also our first wireless recommendation for running, check the guide here. Once you find the right size of ear tips—from 3 different sizes—you’ll soon get used to wearing them, and you’ll forget them altogether. Because they’re light and have excellent ergonomics, they can fit even the smallest ears comfortably. The fact that the Bose wireless earbuds sit on the outside of the ear canal gives high comfort and a secure fit. Overall, we think these are the most comfortable workout earbuds you can get right now. Sturdy build quality, sweat, and moisture resistant, thick and flexible cables, but not tank-like. They are made out of plastics, durability isn’t top notch, but it’s still above average. Build quality is good enough to justify the price, but it isn’t one of the strong points. Build-quality is the only average feature of these in-ear headphones. So don’t expect you can throw them around without adverse consequences. You’re paying a premium price, take good care of them, and they’ll serve you well. They are sweat and moisture resistant so using them in the rain and profusely sweating isn’t a problem. Additionally, the wires are thick and flexible enough to instill confidence, just don’t think they’re fail-proof, they aren’t. Just like all other Bluetooth earbuds, SoundSport Wireless also have an in-line microphone and remote. You can control the volume, song selection and accept or end calls. The microphone voice quality is good enough for making calls, just don’t expect professional headset standards. The buttons are big enough to press without trouble and seem to be built well. Once you get used to them, using becomes a breeze. You’re getting the usual features you can expect from wireless in-ear earphones though not everything. In the price range of premium workout headphones, you can get a heart rate monitor headphones from another brand. For Bose with heart rate monitor, you’ll have to splurge out more. 6-hour battery life, stable Bluetooth connectivity. Bluetooth connection is very straightforward to establish with either, Apple or Android devices, or any other Bluetooth-enabled device for that matter. The connection usually stays stable and doesn’t disconnect, though no wireless headphones are entirely without faults. Sometimes you might experience slight distortion which fixes quickly. Note: Find out the top wireless gaming headphones here. The rechargeable lithium-ion battery lasts up to 6 hours which is a bit less than what you’d want, but good enough for any sports activity. It could be better considering the price but still doesn’t disappoint. Bose bass emphasized sound signature, great for working out, but not for purists. The Bose SoundSport Wireless headphones have the audio quality that you either love or hate. Typical Bose sound signature isn’t balanced but emphasizes bass. If you’re a purist who likes balanced sound signature, then pick the Jaybirds, but if you prefer stronger bass that makes the music more dynamic and fuller, then Bose sound signature will be more to your liking. However, the bass isn’t earth-shattering to satisfy a basshead. Instead, it takes a middle route that’s just enough to annoy an audiophile. For a casual user who likes mainstream sound more, these are perfect. The bass gives you a nice rhythm to follow during your workout. At the same time, you get clear highs and mids. For the best wireless workout headphones that are sweatproof, have great fit, amazing comfort, and fun—bass emphasized—sound, Bose SoundSport Wireless are the top choice. The best and latest waterproof (IPX7) Bluetooth earbuds from Jaybird. A great choice for any sports. In case you’re looking for wireless workout headphones with fantastic sound quality in the category. These are for you. The newest model is better protected from water and sweat than ever before. Now you get an IPX7 certification which means you can easily use them in the rain and even wash them under water. And, just like with the older version, comfort is superb. Lightweight and with memory foam Comply eartips it’s easy to get a comfy and secure fit. They are perfect for running or lifting weights. The buds last about 8 hours per charge but have an annoying feature (more in the review). Questionable durability because the battery tends to develop problems over time. You can have any sound signature you want. Install the Jaybird app, and you can change the audio quality on the go. Like heavy bass? No problem. Prefer a flat response? Tab on the phone and you get immediate sound change. You can make them bassy or balanced. It’s a nice feature that makes these flexible and enjoyable for most people. 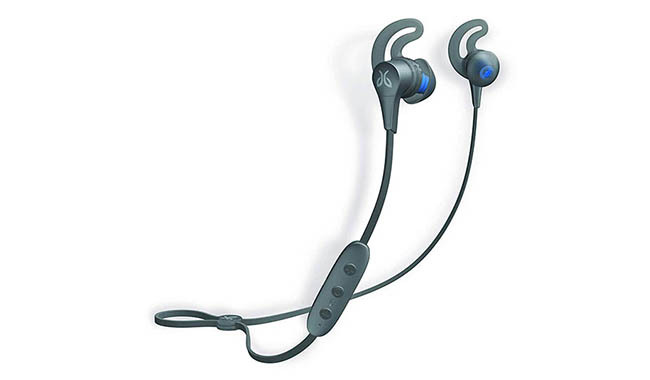 Fantastic comfort and fit with the option to change sound are the two main advantages of Jaybird X4. If that’s important to you, these are your top choice. Note: What are the best Bluetooth headphones right now? While the go-to workout earbuds from Beats were the PowerBeats3, they seem to have gotten worse in the durability. It’s why we don’t recommend them anymore, more on this here. Instead, the best wireless headphones for working out from Beats are BeatsX. While these are not officially sweatproof, they do hold up against sweat and the gym quite well. Good build-quality helps them survive longer. 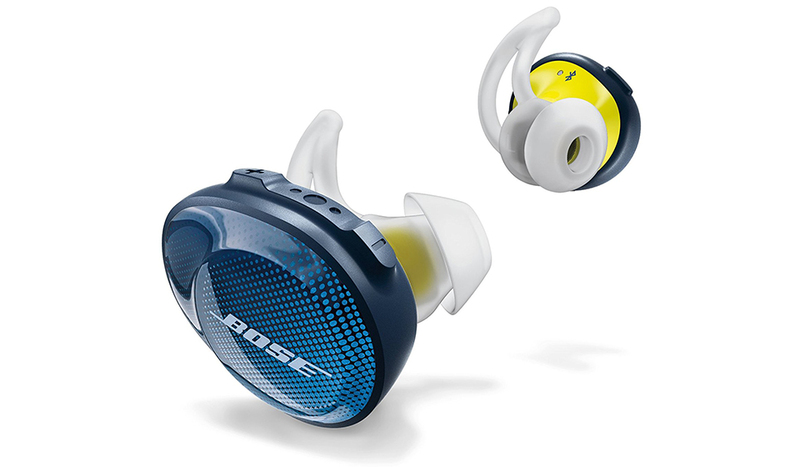 The ear wings give you a stable fit even for working out. With lightweight earbuds, they hardly ever fall out. The only issue might be the battery pack in the cable if you’re doing exercises on your back. However, you can cross the right and left battery packs, and that fixes the issue. Even though they have not been made explicitly for sports, they perform rather well in the gym environment. The magnetic earbuds are very useful for when you don’t need them and can create a “necklace” around your neck. The air-tight fit also helps with noise isolation which removes most of the noise. The Bluetooth technology is stable with built-in remote controls and microphone for making calls. Siri support and RemoteTalk are another bonus. You charge with USB (USB-A) to Lightning cable, and the battery holds solid 8 hours of music. Sound quality is typical Beats. There’s strong emphasis on bass that makes music a lot of fun and great for working out. It exaggerates vocals with clear and present treble that is often overshadowed by the bass. These sound rather good even though they have a very colored signature. Not for purists, but everyone else will enjoy the sound a lot. For Beats fans out there, BeatsX are the best wireless headphones for working out right now. Jabra Elite Active 65t are the best true wireless earbuds for working out right now. With superb comfort, fit and motion sensor for performance tracking—all for a lower price than Bose—you can understand why these are the #1 choice for many people. The truly wireless buds stay in the ears like concrete so you can focus on your workout and not worry about the earbuds falling out—like with many traditional wireless earbuds. If you’re always looking for the best value for money and the latest technology, the Jabra Elite Active 65t with Alexa support are for you. While they cost under $200—which is cheaper than most true wireless alternatives—you still get up to 15 hours of battery life (5h in the earbuds, plus 10h in the charging case) with fast charging. Also, you get a heart rate monitor, so you always know how much you’ve improved. 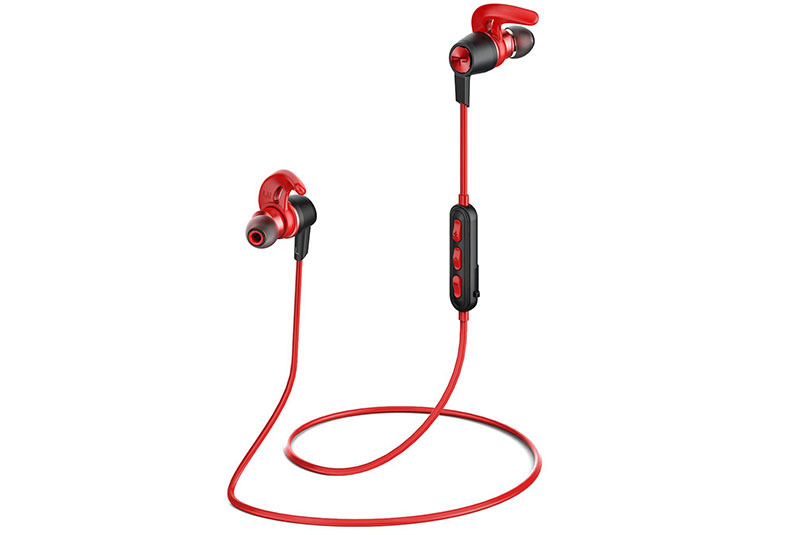 Also, the earbuds are sweatproof and dust-proof with IP56 rating (same as IPX6—what’s this? ), so you can comfortably take them with you in the rain. Ambient noise doesn’t scare them either; they block the noise effectively though you’ll still hear some of it. Finally, the sound quality is among the best of all true wireless headphones for sports. While the bass isn’t as strong—they have a rather balanced sound signature—it’s very satisfying and pleasant for all music genres. The top true wireless headphones are the Jabra Elite Active 65t. The latest and most stylish fitness earbuds from Bose are the SoundSport Free true wireless earbuds. With superior fit and comfort for even the most extreme exercise you are bound to love them. In case you’re a fan of Bose sound quality and comfort, now you know what to get. One earbud in each ear feels natural and freeing. You’ll understand why these are so popular. Furthermore, the true wireless earbuds are fully sweatproof—IPX4—and have an up to 5-hour battery life—plus 10 more hours in the charging/carrying case—which altogether gives you around 15 hours. It’s plenty of juice even for the most extreme fitness nerds. To drown out the noise, the SoundSport Free provide decent noise isolation so you can focus on your workout in peace. Add to this, an enjoyable Bose sound that emphasizes strong bass while keeping highs tidy, you will enjoy all music genres. For under $200 these give a run to most true wireless sports earbuds. Do you hate in-ear headphones because they irritate your ears and keep falling out? 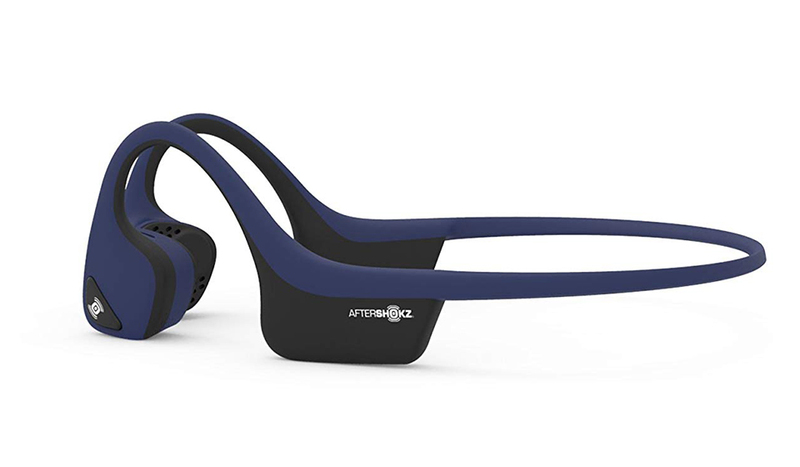 Don’t despair, AfterShokz have a solution. These earbuds don’t go into your ears but instead use bone conduction to transfer sound. It’s a fantastic technology that is hard to believe it works. But it does, while giving you exceptional comfort. Above all, their main advantage is the open-back design. It’s also called open-air design, and it lets you hear all the ambient noise because your ears aren’t plugged. This gives you extra safety in a loud city where you want to listen to your surroundings—maximum situational awareness (there are closed-back versions available too). With open-air design and bone conduction, noise isolation is non-existent, but the closed casing gives extra durability and water resistance, perfect for running and cycling. You can count on up to 6 hours of playtime on one charge. While you should not expect the same sound quality as from conventional headphones, AfterShokz sound satisfactory, and are especially good for audiobooks. If regular in-ear headphones are driving you nuts you can get a great alternative with unique technology. AfterShokz Trekz Air give perfect awareness, are wireless, and are workout-friendly for under $200. Vi Sense wireless in-ear headphones aren’t just headphones; they are a personal trainer as well. An AI—artificial intelligence—trainer with advanced biometric sensors that adapts to your individual needs. If you like tracking your statistics, making the most out of your every workout or lose your motivation quickly, these are for you. Whether you are running, lifting weights or doing another exercise, the Vi Sense will keep track of your progress and keep you focused on your goal. With it, you get a 12-month subscription to the fitness app (iOS and Android supported). Moreover, the Bluetooth earbuds are wholly sweatproof and offer up to 8 hours of playtime. Also, the fit is stable, and the buds stay put even if you do bend overs, great for cardio exercise and running. Above all, the sound quality powered by Harman Kardon is satisfactory for working out with dependable noise isolation for all loud environments. For slightly above $100 you get good wireless buds with a great fitness coach built-in. Plantronics BackBeat Fit quick review. One of the best-rated wireless sports earbuds and, in our opinion, top value for money workout headphones overall. These earbuds were developed specially for sports. Whether you’re running, lifting weights or just playing basketball, these Plantronics are here for you. Stable fit behind-the-neck for all sports. 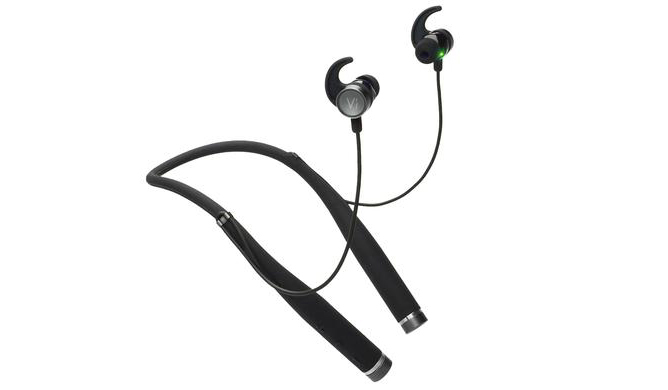 Plantronics BackBeat Fit are one of the most stable and comfortable wireless headphones for working out. Their ear hook design nicely fixes the earbuds to your ears. No flabby wires touching your skin, and you can feel how lightweight and well-designed they are. These IEMs—in-ear monitors—are suitable for all sports activity and they won’t fall out no matter how fast you move if only the fit would be so good with other sports headphones. Comfortable because of the lightweight design, earbuds don’t go too deep. Lightweight design plays a prominent role. You will barely feel them on your head. You can comfortably wear these for hours on end and not get irritated. Great for long workout sessions. It only takes a short time to get used to the behind-the-neck fit, if it’s new to you. Excellent durability, flexible while sturdy with good moisture protection. The headband is made out of flexible plastic that’s able to endure less than decent treatment. Sweating with these is not an issue, they’re sweatproof and waterproof—IPX7—so you can calmly use them in the rain or close to water. Just don’t go underwater, use headphones for swimming instead. You can carry them around your neck or put them in a backpack. Either way, you don’t have to be worried about breaking them. Overall, these are one of the more durable Bluetooth earbuds. On-board controls with smaller buttons which might be harder to press, plus a microphone. The buttons are positioned on the earbuds, and since they are so small, the buttons are small too. This might be a problem for those with bigger fingers and generally, need some getting used to. Nonetheless, controls work as intended; you can change the volume, songs, play/pause, and calls—when you are connected to a calling device. A microphone is a standard among Bluetooth models, and these are no different. The microphone works well for making calls, but don’t expect studio quality. Some background noise might be picked up, though in a typical environment you’ll make calls without any problems. Solid 8 hours of battery life, stable Bluetooth. Bluetooth connection is easy to set up once you get used to controls, it stays connected and doesn’t cut the audio even at 20ft+ ranges. The connection range also depends on what music device you’re using. Making and accepting calls works well, and the sound recorded by the microphone is clear. The battery is solid with up to 8 hours of playtime. It is more or less a standard with wireless workout earbuds and only a few models have better capacity. The good thing is that the battery doesn’t change its capacity over time, so you can always rely on it to last the whole workout session. Excellent sound quality for sports earbuds, but you can get better. Sound quality is probably the only average feature with BackBeat Fit. It’s nothing special and can’t compare to high-end models, but it is not disappointing either. These are, after all, sports headphones. The idea is that you don’t focus on the music while working out but rather on finishing the set and moving your body. If you’re not used to the Hi-Fi sound quality, you probably won’t notice anything wrong with them. While the treble and medium range aren’t most precise and vibrant and the bass isn’t awe-inspiring either, they get the job done. Plantronics BackBeat Fit do almost everything right; great durability, good battery life, comfortable and super stable fit, but with rather average sound quality. Nonetheless, for less than $100 these are near perfect Bluetooth workout earbuds. Definitely best value for your money. VAVA Moov 28 are the best budget workout earbuds right now. At the moment VAVA Moov 28 are the best budget wireless workout headphones. The combination of high durability, water-protection, comfort, fit and fun sound quality for a low price is hard to turn down. Check other top cheap earbuds here. These lightweight wireless earbuds are very comfortable and stay in the ear canal even during fast workouts. Add to this good passive noise isolation to remove ambient noise, and you’re getting a great motivation tool. With the IPX6 rating, you can wash them under water safely—sweat won’t hurt them either. Furthermore, you can control music with an in-line remote and make calls with the microphone. Though these are small, they hold an 8-hour charge with a stable Bluetooth connection in the 33ft range. Additionally, you get good sound quality with aptX technology and a somewhat balanced audio signature. You can notice some emphasis on bass and treble—hinting on V-shaped signature—but it’s closer to balanced than bass-heavy. Sweatproof and durable design, comfort, stable fit, good sound, and an unbeatable price make VAVA Moov 28 the best cheap Bluetooth earbuds for working out. Read the full review of VAVA Moov 28. 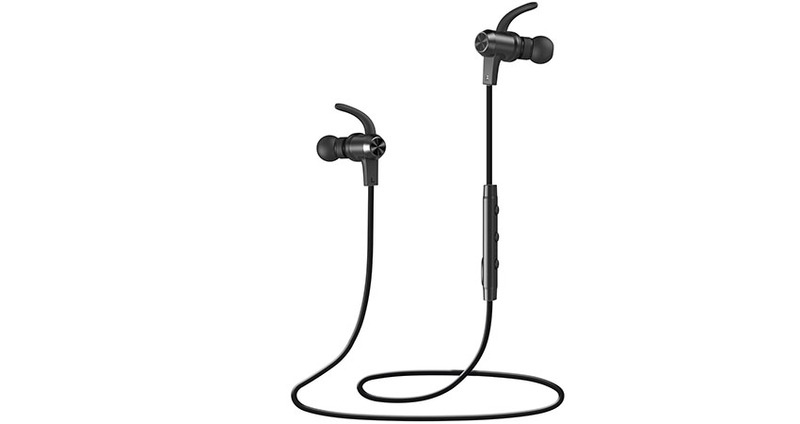 Anker SoundBuds Slim+ are one of the cheapest fitness headphones with Bluetooth. Their low price at under $30 and solid performance makes them a real contender. Read the full review. If you’re one of those people who is always looking for dirt-cheap gear that is good, then you should check the SoundBuds Slim+. Overall, the Bluetooth earbuds aren’t anything special, but the low price and many features make them a great buy. You get entirely sweatproof earbuds—rated as IPX5—with a stable and comfortable, fit due to lightweight and ergonomic design. SoundBuds are suitable for all kinds of sports except swimming. Additionally, the battery holds for a solid 7 hours and supports fast charging. This is plenty of power that will last you more than just one workout. With the right ear tips and wings, you also get substantial ambient noise isolation—suitable for the loudest gyms. Similarly, the audio quality is likeable with pronounced bass and treble that sounds much better than $30 would warrant (the Slim+ have aptX support). Overall, they are a great budget purchase that will last for a long time for little money. The Origem HS-1 are wireless in-ear headphones with a waterproof design. They’re IPX7 certified which means you can easily get them wet or soak them in sweat (but can’t swim with, for swimming headphones go here. Should You Buy These: If you’re looking for affordable and wireless earbuds suitable for sports, you should check these out. For Bluetooth earbuds under $40, they’re well-built and have a loud, V-shaped sound. Even though these are a budget model, you get a lot of features for the price. The battery is especially powerful giving your up to 10 hours on a full charge… Most high-end workout earbuds don’t offer that much juice. 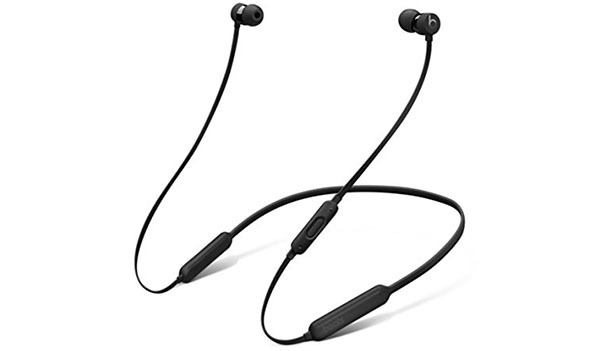 Add to this, a durable, waterproof build-quality and a stable fit that you can run or do aerobics with you have a great pair of wireless workout headphones. Of course, they don’t come without problems. The Bluetooth connection is painfully weak when you put a wall in between. You should keep your smartphone close at all times. Plus the buds are quite big in size and stick out of the ears funny. It’s a usually “issue” of wireless buds. Thankfully, the sound is fun and enjoyable to listen. You get a loud, V-shaped sound (did we say these are loud?) that is perfect for workout oriented music that’s rich in bass. For one of the best wireless workout headphones under $40 on the market right now, you must check out Origem HS-1 with great battery and water-protection. See the full Origem HS-1 review. In case in-ear headphones aren’t comfortable for you, take a look at on-ear headphones. Made specifically for sports, you get all the features, durability and a stable fit in on-ear design. 66 Audio BTS Pro quick review. 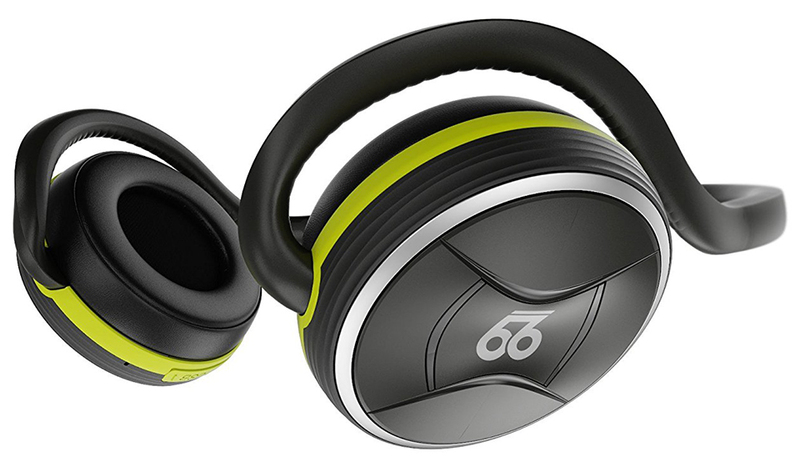 66 Audio BTS Pro are the best wireless workout headphones with the on-ear design you can get right now. For under $100 they aren’t affordable but still great value for the money. Of all wireless workout on-ear headphones, these are our top recommendation. Note: You can get a newer Pro Voice model which is basically the same headphones with added Alexa support. Because the Alexa is too clumsy to use, we instead recommend you get the BTS Pro model. The on-ear workout headphones are an excellent choice if you have problems with earbuds. There are so many incredible features these have it’s easy to understand why they’re so popular. Lightweight and stick to ears well. These are worn behind the neck, hooked to ears. The fit is stable even for running unless you have tiny ears. They are lightweight and don’t bounce a lot. Compared to earbuds, all on-ear headphones will be slightly harder to keep on during fast exercise. Weight does have an impact, so, it’s good to keep that in mind when choosing. Thankfully, the new BTS Pro have shed weight and are sporting 2.9 oz (83 g) which is still more than in-ear headphones. Nonetheless, for less intense exercise like cycling they are perfect. 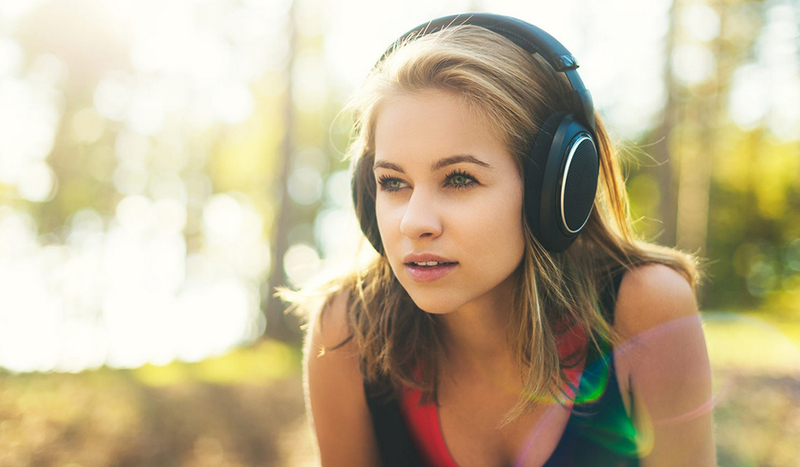 The on-ear fit is very comfortable for working out and listening to the music for hours. While other on-ear models are softly pushing on ears and when worn longer, they become uncomfortable, this isn’t the case with BTS Pro. The memory foam earpads are comfier than ever before. In reality, you’ll soon forget you’re wearing them, so you can focus on doing one more set or a couple more miles. You will have a hard time finding more comfortable on-ear headphones with Bluetooth and sweat-protection. The clamping force is just right, and you can wear them behind-the-neck or on top of your head like regular headphones. It all depends on what’s more comfortable for you. Sturdy plastics, headband design, reliable durability, sweatproof. Durability wise these are sports headphones made out of sturdy plastics. The older 66 Audio model wasn’t water-resistant, but the BTS Pro are fully sweatproof. Additionally, the materials feel solid as well as the build quality. Now because of their weight, you can’t throw them around and expect they’ll hold for long. Keep them in a carrying case—which you get in the package—to protect them from physical harm and failure. Great customer service helps here as well, if you have any problems with these, contact support and most often than not they will replace your defunct pair of headphones for new ones. The built-in controls are intuitive and easy to use. You can connect 2 devices at the same time, accept and make calls and control everything from the multi-function controls on the right headphone. The call quality is outstanding—clear voice recording with noise cancelling technology. Moreover, the buttons are easy to use, which is still not usual for today’s headphones. Aptx support, stable Bluetooth connection. Great battery life. 4.2 Bluetooth connection works with iOS and Android devices or any Bluetooth MP3 players for fantastic 100ft. The signal range is much better than with competitive Bluetooth headsets because of the so-called “3D antenna”. The improved Bluetooth range is useful in larger gyms and sports courts. Furthermore, the 66 Audio BTS Pro have full aptX support for better sound compression. aptX brings better sound quality over Bluetooth, just make sure to have an aptX music device. Most Android smartphones have it. Battery life is the best in the category. You can get up to 40h—upgraded from 25h—of playtime with just one charge. This is many times more than any Bluetooth workout earbuds. Because 66 Audio went on with times they’ve used USB-C cable for fast charging—you’ll have to throw away your old micro-USB cables as they’re worthless. Quick charging substantially shortened the charge time which is now only 90 minutes. That’s impressive battery performance by any standards. The sound is engineered to fit the role of fitness headphones, which means powerful, deep bass. With 36mm drivers you won’t miss the emphasis on the low range, and you probably won’t mind it either. Because a bassy sound signature is preferable in sports circles for adding rhythm and motivation, this is precisely what you get. Strong bass to keep your going further and longer than before. Thankfully, other ranges don’t suffer, and you get a beautiful representation of mids and highs which aren’t too harsh or lacking in detail. Overall, we can say they sound the best of all fitness on-ear headphones—just don’t compare them to audiophile cans. With amazing battery and comfort, plus a sweatproof design and enjoyable bassy sound, the 66 Audio BTS Pro are the go-to choice for sports on-ear headphones. 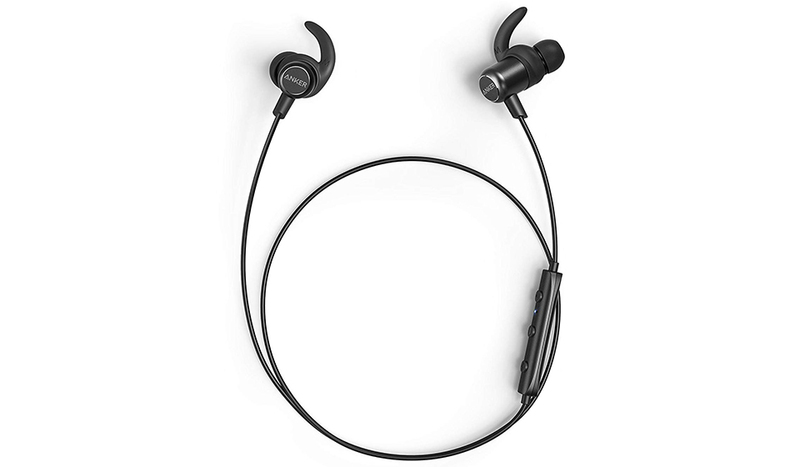 Plantronics BackBeat FIT 500 are the same headphones as the BackBeat 500 model that has been available for some time. Only the “FIT” model also has a so-called “2Pi” coating that makes them sweatproof. They also cost a bit more money but are still great value-for-money on-ear headphones for the gym. With a superb battery that gives up to 18 hours of playtime and stable Bluetooth connection with the standard range of 33ft (10m), you’re going to free yourself from the wires. You can connect them to multiple devices at the same time and use their built-in buttons for controlling music and microphone for calls. The build quality is reliable, and with the added anti-water coating you can comfortably use these for any sports. The fit is stable, and you can even use them for more vigorous exercise just not something like sprinting. 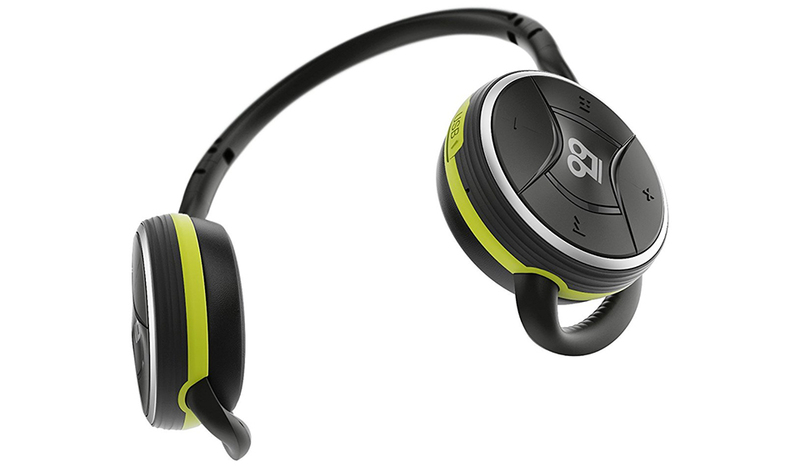 BackBeat FIT 500 are most suited for weightlifting where you don’t move your head a lot. Moreover, memory foam earpads covered in leatherette fabric give comfort and protection. Combined with closed-back design gives good noise isolation that removes ambient noise around you. It’s beneficial in a loud gym. The sound is above average too. They are bass emphasized which suits nicely with all the gym music. The bass is loud and punchy making music sound full and fun. Treble is detailed, though at high volumes slightly sibilant. Overall, they have a great gym sound that will be appreciated by most. If you need great value for money wireless on-ear headphones for the gym, Plantronics BackBeat FIT 500 are the way to go. Monster iSport Freedom quick review. Monster iSport Freedom are one of the best workout on-ear headphones with wireless technology, sweatproof design, and excellent sound quality. Indeed made to live in hot, sweaty gyms. 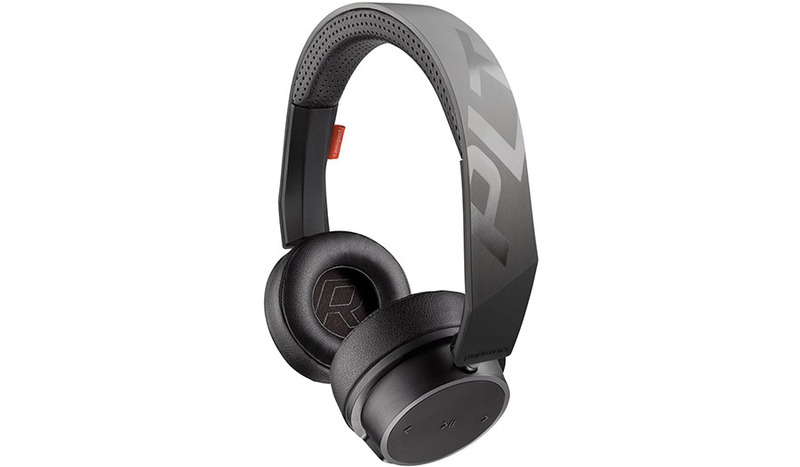 Of all the on-ear Bluetooth headphones for sports, these are one of the best and the only thing stopping them is their higher price (around $200). The lightweight design stays on the head, with substantial noise isolation for on-ear headphones. Keeping them on the head is very easy. They stay on even if you do bench presses or any other exercise where your body lies flat. Rubbery headphone cushions help with that, as they almost stick to your skin. Monster iSport Freedom have decent noise isolation, which does the job perfectly for gym conditions. In case you’re wondering if they are noise-cancelling, they’re not. Read about the difference here. For example, you won’t hear other gym-goers breathing and running on a treadmill next to you, but you will hear if someone shouts. They also don’t leak sound, so you can easily enjoy your Justin Bieber without fear of getting caught. Comfortable for hours, but on-ear design starts irritating after a while. 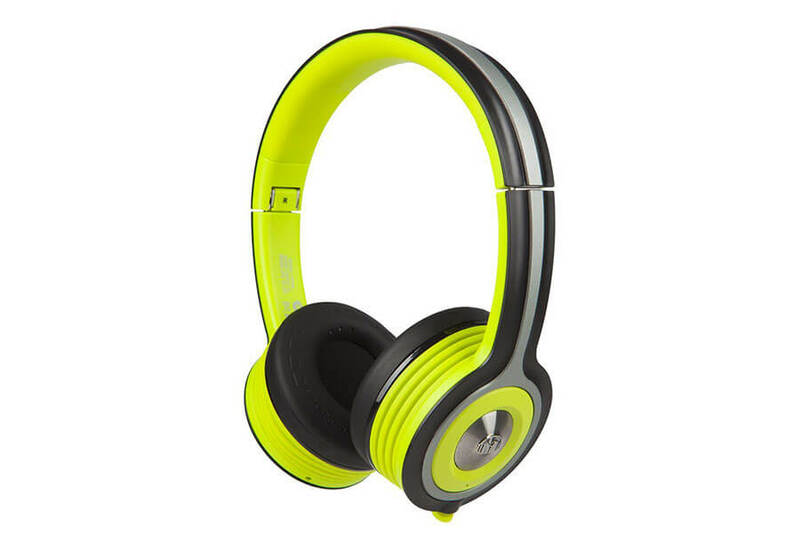 With a lightweight design and flexible structure, these are quite comfortable for on-ear headphones. It all depends on your head size, but if you’re somewhere average, you should have no problem wearing these for the whole workout. As for extended listening 2-3 hours or more, you should pick some other on-ear or in-ear headphones—unless your earlobes never feel pain. The rubbery earpads can get irritating after a while. Nonetheless, for an average gym goer, these are very comfortable and should last for the whole training session. Durable, sturdy, and flexible plastics. Also water resistant, perfect for sports. Since Monster created these for sports, you don’t have to be too careful. You can freely get them sweaty or even wet, they are washable so if you get them dirty, rinse under water and, voila, good as new. iSport Freedom are made out of durable plastics and rubber. Also, the foldable and flexible structure makes them strong enough to survive accidental drops on the floor or harsh backpack travel. To sum it up, they are a durable pair of headphones, as they should be for the high price. On-ear buttons are easily accessible and using them is simple. Controlling volume and songs with headphones becomes a habit. The built-in microphone works but doesn’t record perfect, crispy clear sound. It’s still usable for making calls, just don’t expect better than phone performance. Stable Bluetooth, good battery life. Wireless connectivity works nicely, connects to all Bluetooth devices and doesn’t disconnect up to standard 30ft. The battery is acceptable with over 20 hours of constant playtime, though you can get better for less money. Its is an older model which explains lower battery capacity. For an average fitness enthusiast, this is probably enough power for the whole month of workouts. Heavy bass, aptX & AAC support, good sound quality, but not for audiophiles. The sound has the perfect combination of highs, mids, and bass for gym environment, which means V-shaped audio signature. It’s not going to satisfy an audiophile, especially when there are so many great headphones at $200 price mark on the market. However, for fitness these are perfect. Powerful, punchy bass that gets you going through your last set of lifts or those last minutes of aerobic exercise. Add to this, a nice combination of crisp mids and highs, and you get a happy gym rat (gym goer). Furthermore, they are loud enough and will help you maintain the tempo with any exercise. Featuring aptX and AAC helps with wireless transmission and gives better audio quality. As said before, the sound quality is nothing special, but for working out, this isn’t even that important. You should focus on pushing yourself harder and not concentrate on the sonic richness of the sound. In conclusion, if you don’t mind the price, Monster iSport Freedom are one of the best Bluetooth on-ear workout headphones with super durable and flexible design, good battery life and sound signature that gets you working out harder. Why should you trust us? Check the link below to find out how we came up with this list. 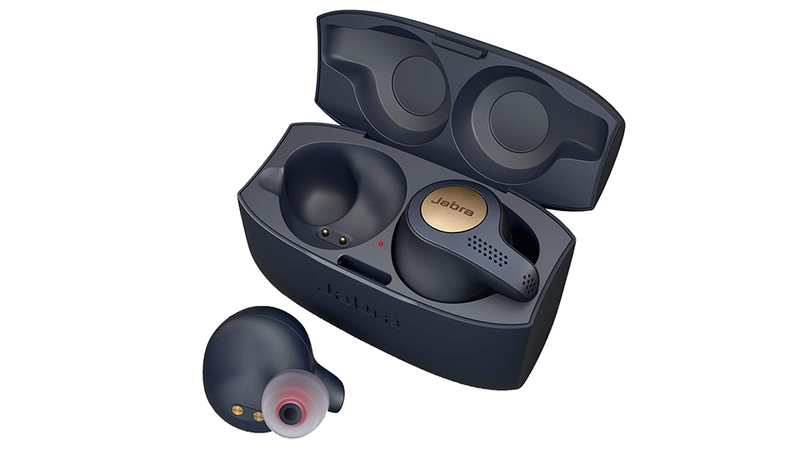 We see some big websites recommending Jlab Audio Epic2 wireless earbuds for working out. We don’t agree with that recommendation. In fact, we recommend against Jlab Audio Epic2 because of their poor durability. It seems they have a problem with sweat and moisture in general and die out pretty quickly. We recommend staying away from the 1st Jlab Audio Epic model as well. They seem to die out pretty quickly. Instead, take a look at some of the better options here. Beats PowerBeats3 used to be our #1 recommendation for Beats workout headphones but ever since 2017 the durability has gotten worse. While we still like these in-ear headphones more and more people report lousy build-quality and “short life expectancy.” It’s the reason why we recommend the newer and better built BeatsX. You can still get PowerBeats3 yourself, but you should be aware of the durability issue. Plantronics BackBeat FIT 300/305 might seem like a good option since the BackBeat 500 are first-rate, but they seem to have a build-quality issue. You might want to wait a bit longer and see if they fix the problem. These are a relatively new release and might improve over time. Sennheiser CX Sport are the newer wireless workout headphones from this German brand. In contrast to their positive reputation, this model seems to suffer from signal interruptions and is better to avoid. You can get more for the same money elsewhere. Honestly, we don’t recommend over-ear headphones for sports. Big, heavy headphones don’t keep proper fit during exercise. You will only have problems with constant readjustment. Over-ear headphones are simply too big and heavy for working out. The over-ear headphones are designed for non-active listening. Relaxing on your couch and listening to your favorite tracks in ultimate comfort. Due to the comfort, they are made big with lighter clamping force. As a result, all that size shows in weight as well, which proves a big problem when you start moving. If you genuinely don’t like the in-ear monitors for your exercise you can always check the smaller and lighter on-ear workout headphones. On-ear cans are much better suited for sports. In any case, if you insist on over-ear sports headphones, you should pick ones with strongest clamping force and low weight. Then again, you don’t have to believe us. Try over-ear headphones yourself and maybe you find a model that is just fine and when you do, tell us about it is so we can review it. They must stay in place. You probably already know how annoying it is when you have to readjust the headphones constantly. The better sports headphones will stay put even during the most intense exercise. How to improve the fit of workout in-ear headphones. Different designs, like ear-hooks, memory-wires and strong clamping force (on-ear only) help keep the headphones in place during exercise. Comfort comes in the same category. Feeling discomfort is the last thing you want during a workout. You’ll only get annoyed and lose motivation and focus. With in-ear headphones make sure to pick the right ear tips that will feel comfortable—they make all the difference. On-ear headphones are a good alternative to smaller earbuds. Resistance to sweat and moisture. Sports headphones have to be resistant to moisture. Because, if you’re pushing yourself you’ll be sweating like a pig. All this sweat comes in contact with the wireless workout headphones—that have lost of electronics—which can damage it. It’s not uncommon that a bit of sweat kills the headphones forever. That’s why you should look for sweat-resistant or sweatproof headphones—even better if they have a certified IPX rating. The higher, the better. What’s IPX? Explained here. 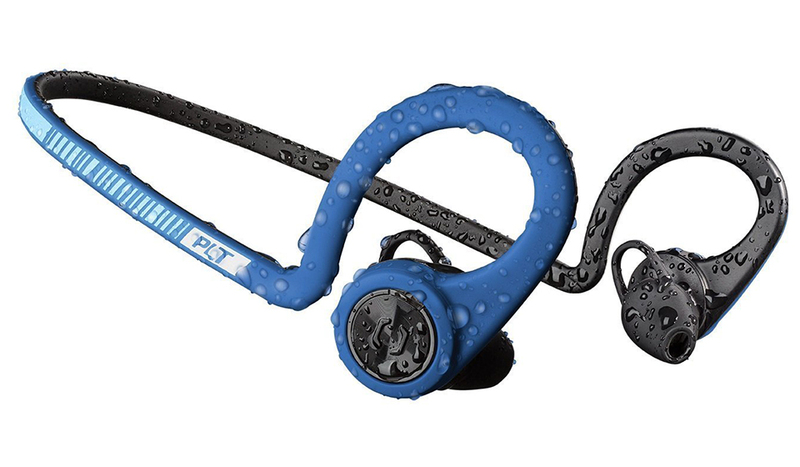 With Bluetooth workout headphones—Bluetooth works fine in the rain, but not in water—you won’t have to worry if you get caught by rain or if you sweat profusely. Sweat resistance is a must for all sports headphones. Physical durability is an essential factor as well. 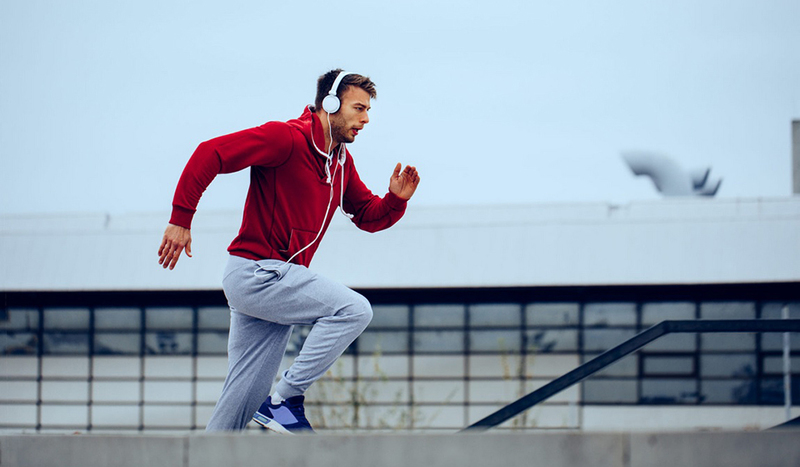 During exercise, you are moving fast, and you’re more likely to hit and damage your headphones accidentally. Perfect gym headphones have to sustain hits and bumps without suffering damage. If you’re a regular gym goer—as most are—you’ll be using your headphones quite a lot. Picking a well-built product will save you money in the long run. Noise isolation is relevant because you don’t want to be bothered by the ambient noise. Also, other people might hear what music you’re listening to, which might be embarrassing—if you’re a Hannah Montana fan. Here are best noise isolating earbuds. On the other hand, in some situations—like running in the city with traffic—good situational awareness is critical. Knowing where the danger lurks can save you from injury. In this case, you should get open-back, semi-open or open-air headphones with no passive noise isolation. You can check the best running headphones here. Battery and connection strength are crucial too. The wireless gym headphones need to have enough power to get you through at least one workout—if not more. The battery dying right in the middle of a workout is irritating. Since most people are not working out several hours every day, you should look for wireless workout headphones with at least 4-5 hours of battery life. All headphones on this list fulfill this minimum, even the true wireless ones. Sound quality also comes into play. Just because you’ll use the headphones during exercise, doesn’t mean you have to suffer lousy sound. Maybe high audio quality isn’t crucial in the gym. Nonetheless, you want to enjoy your music without irritation. Most people prefer an emphasis on bass for exercising because it gives rhythm and motivation. Most of the wireless workout headphones in this article have a bass emphasized sound signature. Check the reviews for more info. It used to be a hard question. However, today all the major headphone manufacturers made their flagships wireless. When the Bluetooth technology was in diapers, it was less reliable and more expensive. That’s not the case today. There’s a couple of benefits to wireless workout headphones and a few flaws. The freedom of not having any wires is a substantial selling point. You can put your iPhone or Android smartphone somewhere in the gym, connect it, and start working out. If you’re exercising outside, you can put your phone in the pocket and never have to worry about pulling on wires. The only problem with Bluetooth headphones—now that audio quality isn’t such a problem anymore, thanks to bit rate efficiency—is the battery. It needs constant charging, it adds weight and is prone to deterioration. Thankfully, the new wireless earbuds can last around 8 hours and are filled up in under 2 hours with quick charging. If you don’t mind charging the battery, wireless headphones are the way to go. On the other hand, wired sports headphones are usually cheaper and more reliable. Wires are a proven technology that works well, especially with improved tangle-free cords. No need to think about charging the battery, only plug in and play. You do have to keep your music device in your pocket, but then again, you’re probably used to it. In the end, it comes to personal preference. Overall, the Bluetooth workout headphones have become excellent. Thus they easily out-compete the wired competition. Yes, but only if the water protection of your sports headphones is high enough. We recommend IPX5 and more. Just because the manufacturer says the headphones are waterproof or sweatproof, it doesn’t mean you can shower with them. You’d need at least IPX5 (more is better) to shower with your workout headphones comfortably. IPX explained here. The problem is, not all companies reveal their IPX ratings. Bose, for example, won’t tell you the IPX of their models. In cases when you don’t know it’s better not to try it. Thankfully, there are dedicated swimming headphones you can check out. Top passive noise isolating headphones. The most rugged earbuds on the market. Get an advantage with top gaming headphones. Disclosure: We might receive affiliate compensation if you purchase products via links on this page. This is how we purchase headphones for new reviews and keep the site adds-free. In spite of that we do our best to tell the truth about every product and don’t favor any one brand or model.